GESTAR 2016 (multilanguage: English/Spanish/French/Portugese) is avalaible (latest update: may, 6th 2016) in Software Download section. Integration of optimum design & hydraulic and energy analysis in a single application, not only makes your work easier and quicker but more importantly, lets you find much more economical and reliable solutions than using processes based on simple optimisation routines. High performances in optimum design of branched networks with a given layout, including multiple options, protocols and easy-to-use tools helping you to find solutions with significant reductions in system costs. 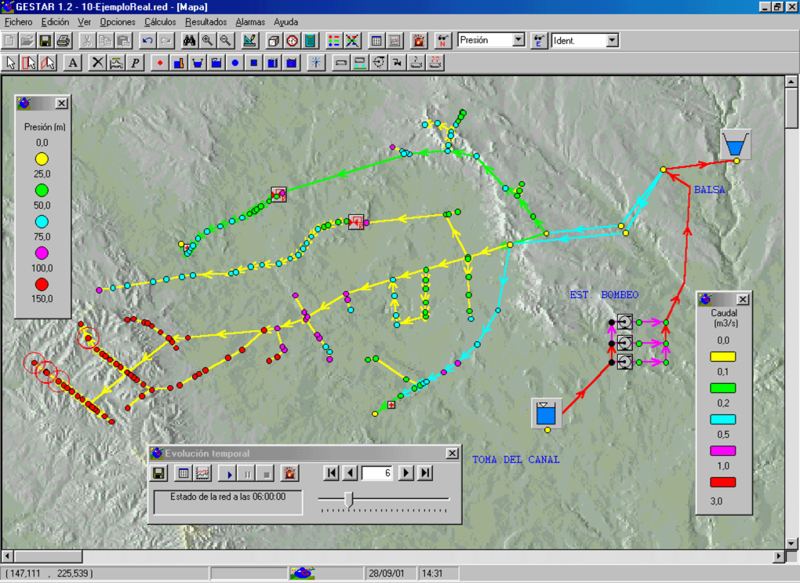 Integration of all modules and tools in an intuitive interactive graphic interface, and communicating using the ACCESS standard as an intermediary with all types of CAD/GIS systems or third party software. Integrated utilities for simple and direct two-way topology and data transfer with AUTOCAD 2010-2012. The hydraulic-energy analysis module, uniquely robust, flexible and efficient, was developed specifically for GESTAR with exclusive capabilities, such as inverse analysis, efficient treatment of low resistance elements and regulating valves, advanced modelling of point emitters and trickle lateral lines with emitted flow depending on pressure, characteristic curves of pumps with inflection points, modelling of direct pumping stations using system operation curves, etc.